S/.02 = size of resistor needed. Actually different colored LEDs have different voltage drops. Red LEDs run at 2 volts, white LEDs run at 3-3.5 volts and IR LEDs run at about 1.3 volts. You need to know both the operating voltage and current for each one. Here are some online calculators for sizing resistors. A couple of nice calculators there Rich. But there is something that still nags at me, because they all show options for both serial and parallel LED circuits. ALL tell me the same thing over and over - wiring LEDs in series is bad practice. That while they will work, that internal differences between individual LEDs will cause uneven illumination which may affect performance for the task. And 2 - the obvious, if anything goes wrong with the circuit, 'jo citizen' has to try and figure out whether it is the resistor, the wiring or any one of those LEDs, which makes fault finding problematic for them. SO what has been your take on that 'point of order' ? It is true that with LEDs wired in series the whole string will go out if one of them fails, in addition it is more difficult to find the bad one. If you wire four white LEDs in series you can power them with a regular 13.8 volt power supply. If the voltage is correct LEDs last a very long time. I have Hi-Fi equipment with LED pilot lights and those have been on for hours a day for more than twenty years. 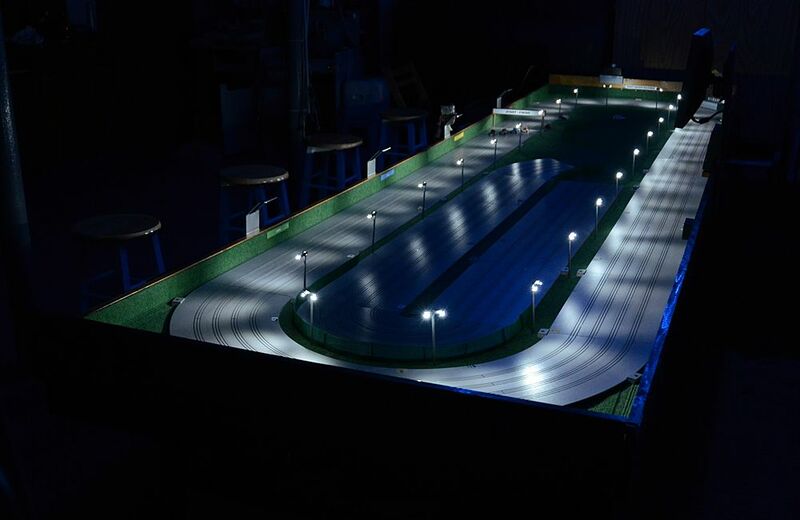 My track is lit with white LEDs, there are two lights on each pole to look like the type that were used on 1:1 circle tracks in the '60s, those are wired in series and I power them with a variable supply set at 7 volts. In the case of the IR LEDs that would be used with a timing system it is best to wire them in parallel with a separate dropping resistor for each one.